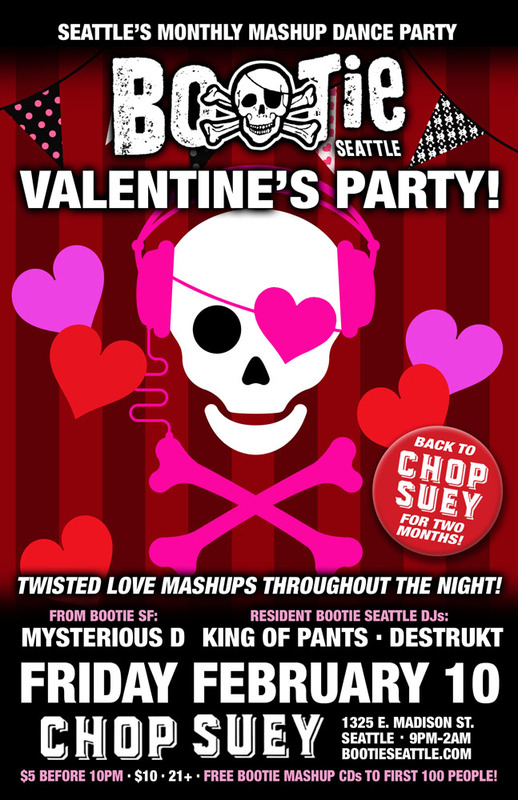 Bootie Seattle @ Chop Suey — Valentine’s Party! Seattle Bootie Seattle @ Chop Suey — Valentine’s Party! Bootie Seattle gives our heart to Chop Suey -- our original Seattle home -- for one final month before returning to Neumos, and what better way to celebrate than with a Valentine’s Party? Bootie’s resident DJs throw down a night of mixed-up mashed-up love songs for you -- whether you come with a date or pick one up here! Only $5 before 10 PM! It’s the Bootie Seattle Valentine’s Party at our original Seattle home, Chop Suey! Whether you love Valentine’s Day or loathe it, Bootie has got mixed-up, mashed-up love songs for you! Bring a date, or find one here! Get ready for some wet kisses, as Bootie co-creator Mysterious D comes up from San Francisco to joing Bootie Seattle resident DJs King of Pants and Destrukt, as they all spin a night full of mashed-up love songs to get romance sparking on the dance floor! Plus free Bootie CDs for the first 100 people through the door. Don’t forget to WEAR RED!